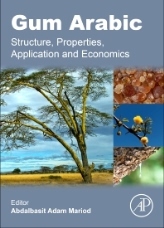 Gum Arabic : Structure, Properties, Application and Economics explores the management practices of gum Arabic producing trees and their environmental role, the characteristics and properties of the gum, and presents current and developing uses in food, feed, and medicinal applications. The book provides insight into regulatory aspects of production and quality control as well as underscoring some of the geographically based differences in gum Arabic trees, production, and regulation of products. Written by experts in the field, the book provides current research and developments in gum Arabic. It is an important resource for researchers in industry and academia interested in the advances in this area.